Eating well, staying active, and following our doctor’s orders are key factors in staying healthy. But too often, we forget that perhaps the most fundamental determinant of our well-being is where we live – without access to affordable housing, everything else is irrelevant. Unfortunately, a lack of affordable housing has become the new normal in the United States. According to the Institute for Housing Studies, Cook County alone lost an estimated 15,000 two- and four-flats since 2012. There are nearly 182,000 renters in the City of Chicago who need low-income housing but are unable to find any, as the total supply of affordable housing stock has decreased by 10.4% over the past six years. Christian Community Health Center (CCHC) and Full Circle Communities (FCC) realized this is one disease whose cure could not be found within the walls of a clinic. To that end, in 2015, the two Chicago-based non-profits finalized a plan to bring 36 units of integrated supportive housing to a long-vacant site in Chicago’s Brainerd Park neighborhood. Three years and $12 million later, the Brainerd Park Apartments finally celebrated its grand opening on September 28, 2018. Community leaders and residents gather near the front entrance of Brainerd Park Apartments before the grand opening ceremony begins. Located at 8920 South Loomis Street, Brainerd Park Apartments consists of one- to four-bedroom apartments targeted to renters earning between 30% and 60% of the area median income. Of the 36 total units, eight are specifically targeted to renters defined as “homeless” by the Federal Home Loan Bank. 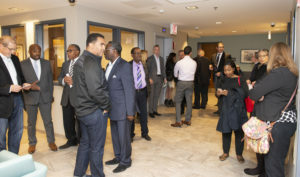 The grand opening provided an opportunity for residents and community leaders to tour the building for the first time. For residents, Brainerd Park Apartments includes on-site management, a library, computer room, and community room. On-site resident service space is staffed by CCHC, where they assist residents in coordinating access to health and wellness services, employment services, and financial counseling. The development is located steps away from the Brainerd Park Library, as well as the Brainerd Park Metra station, which allows for commuters to travel to downtown Chicago in under 25 minutes. 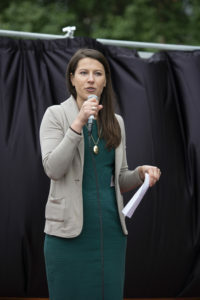 Lindsey Haines, FCC’s Vice President of Real Estate Development, gives thanks to all the partners who made Brainerd Park Apartments possible. The day ended with a massive block party for all Brainerd Park Apartment’s residents and neighbors. 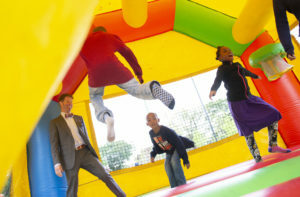 Events included a hot dog cookout and a bouncy castle for the kids, which at times was even enjoyed by some of FCC’s staff. Josh Wilmoth, FCC’s President, taking a break to enjoy the bouncy castle with some Brainerd Park Apartments’ youngest residents. In all, the event was a great success, and enjoyed by everyone who attended. FCC is happy to add Brainerd Park Apartments into their portfolio, and is looking forward to continuing access to affordable housing in Chicago and beyond. How soon will we hear something? That depends on where you fall on the waiting list for the property. If you want, you can call our management office at 847-849-5301 to see where you are. I would call next week, though, as they are out of the office for most of the rest of this week. Do you have to apply for section 8 or low income before you try to live here? Or can you provide bank statements showing your income is low and still get in? You don’t need to have section 8 to move in – all you have to do is show proof of your income. Providing your bank statements is enough.